Jennifer McConnachie of the BC TRCR presents the Coal Reclamation Award to Warn Franklin on behalf of Teck Coal Ltd. in Williams Lake on September 19 for work at Horseshoe Ridge at Line Creek Operations. 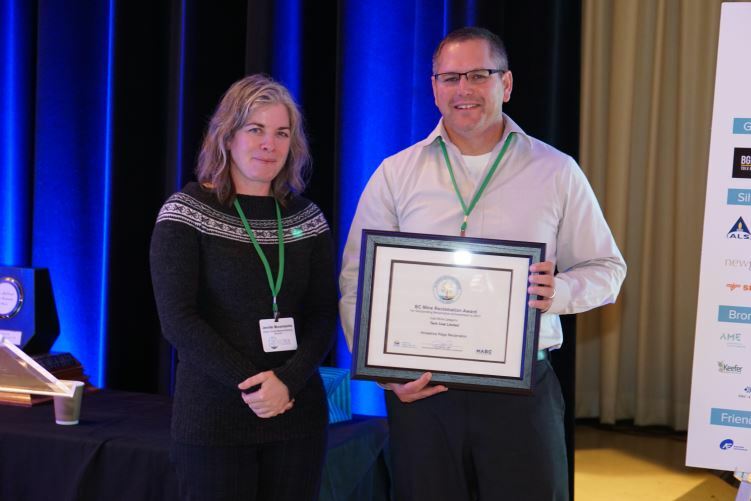 Williams Lake, B.C., Canada – The British Columbia Technical and Research Committee on Reclamation (TRCR) presented the 2017 BC Mine Reclamation Award at its 41st Annual BC Mine Reclamation Symposium in Williams Lake last Wednesday. The Jake McDonald Annual Mine Reclamation Award was presented to Teck Highland Valley Copper Partnership for its use of tailings ponds and pit lakes at its mine near the town of Logan Lake, B.C. for aquatic habitat and as passive water treatment facilities. “The resulting progressive reclamation of the Bethlehem, Trojan, and Highmont tailings ponds, and the Huestis, Iona, and Jersey pit lakes that has occurred over 20 years demonstrates that Highland Valley Copper is a global leader in this area of mine reclamation science,” noted Jennifer McConnachie, Chair of the TRCR Awards Subcommittee. “It is for their work in reclamation research and biomonitoring with the goal of achieving productive end land uses and improving water quality for aquatic mine facilities that we are recognizing Highland Valley Copper today.” The results of the reclamation include a self-sustaining rainbow trout fishery, reduction of metals such as molybdenum and copper in water, and use of the ponds by a diverse animal population including 150 bird species. Teck Coal Ltd. was presented with the Coal Reclamation Award for its reclamation of Horseshoe Ridge at Line Creek Operations located between the towns of Sparwood and Elkford in southeastern B.C. The company engaged with local communities, the Ktunaxa Nation, and regulatory agencies to develop a new approach to reclamation. One example of the approach to increase biodiversity is in the variety of plant species used – in 2013 and 2014, for example, approximately 250,000 seedlings including 34 different native and culturally important species were planted. Preliminary results from monitoring indicate that this new approach is working. 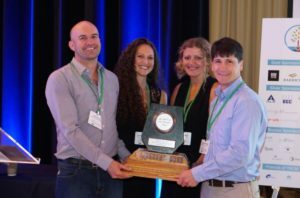 Chris Hercun, Sarah Whitehouse, Jaimie Dickson and Richard Doucette of Teck Highland Valley Copper Partnership receive the Jake McDonald Annual Mine Reclamation Award in Williams Lake on September 19. The TRCR originated in the early 1970s in response to a demonstrated need in the British Columbia mining sector for greater government-industry communication in the area of environmental protection and reclamation. Membership is drawn from industry, provincial and federal government agencies, exploration and mining associations, and universities and colleges. The Committee meets to discuss matters of joint concern and interest, exchange experiences, plan activities, and prioritize research needs. It sponsors the BC Mine Reclamation Symposium and studies on reclamation-related issues. www.trcr.bc.ca. Follow @TRCR on Twitter: https://twitter.com/TRCR. For enquiries contact Jonathan Buchanan at 778.840.0620 or jbuchanan@amebc.ca.